The Phillies bullpen has been a point of concern all season and it cost the club on Tuesday night, surrendering five runs in a 10-6 extra-innings loss to the Nationals at Citizens Bank Park. Aaron Nola pitched well until the seventh, but he allowed four runs in his final 1 1/3 innings of work and left with the Phillies clinging to a one-run lead. Edubray Ramos surrendered a solo shot in the ninth that allowed the Nats to even the contest, then Luis Alvarez let the game get away in the 10th when he allowed a three-run shot by Juan Soto to put the game out of reach. Manager Gabe Kapler was without some arms in the pen - namely Pat Neshek and David Robertson - to give them rest. As for Nola, he now has a 6.46 ERA through three starts and has already surrendered five homers on the season. “I would classify it as uncharacteristic,” Kapler said. “I think we’ll kind of lean on the two years of history that suggest that this is probably not Nola. We certainly have to dig into why the balls are flying out of the ballpark. That’s an important part of our process and we’ll do that, but we’ll probably lean on the two years of track record of not giving up the home runs." 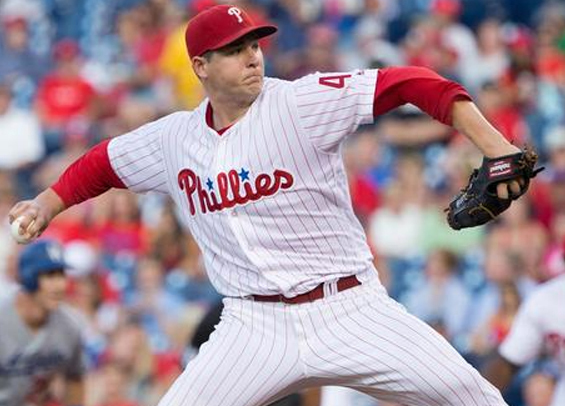 Nick Pivetta toes the rubber for the Phils tonight, aiming for his first quality start of the season. He's pitched to a 6.52 ERA over 9 2/3 innings this season. The Nats counter with former Phillie Jeremy Hellickson who will be making his first start of the 2019 season. Roman Quinn had his rehab assignment moved up to Triple-A Lehigh Valley today. In three games with Clearwater he went 4-for-9 with a homer, two walks, and a stolen base. The Phillies could add him to their roster as early as this weekend. The 25-year-old has been mending right oblique strain.